BLANTYRE-(MaraviPost)-Readers may have read about the official Malawi launch of (not one but) six books. 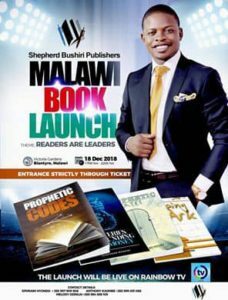 Written by Malawi’s own renowned Prophet, Shepherd Bushiri, the six books are set to be officially launched in Malawi at the Mount Soche Hotel in Blantyre on December 18, 2018. Money is an absolute necessity in the lives of all people. These days, there is not much one can achieve without the use of money. In this book, Prophet Shepherd Bushiri reveals the secrets that God revealed to him about money and the mysteries that surround it. Like all men of God, Bushiri recognises the importance of money in ministry. He shares his experiences that led him to the revelations about money. Furthermore, he writes how money fits in the lives of Christians, the causes and hindrances that stand against them receiving and living in the promise of prosperity, and the principles of the Kingdom of God regarding money. “How many things were you supposed to accomplish for the Kingdom of God, but you failed because money had been a problem?” asks Shepherd Bushiri in the book. Answers are provided. Prophet Shepherd Bushiri is a world-renowned business tycoon with years of experience in running multi-billion dollar companies all over the world. For this reason, he has penned an entire business series containing five subjects of focus. In this book, Crafts of Effective Public Speaking, which forms part of the business series, Shepherd Bushiri reveals seven ways in which one can speak effectively and affluently before crowds. This book gives people additional assistance with all the major elements of effective speechmaking and verbal presentations. Master the art and crafts of successful oral deliveries through practical and viable advice drawn from the well of wisdom that comes in the form of Shepherd Bushiri. The ability to deliver effective oral presentations in a variety of technical, spiritual, and even the business environment, is a skill every professional should have. No matter what your field of expertise may be, this practical guide equips you with a broad range of proven crafts, tools, and insider tricks of the trade for effectively conveying complex, and easy-to-read scientific, philosophical, literal, technical, or business information to any audience. The prophetic ministry is quintessentially different from the other five-fold ascension gifts. While other ministerial gifts give an individual the opportunity to stand on behalf of the people to speak to God, the prophetic enables an individual to stand on behalf of God, Himself. In this extraordinary book, Shepherd Bushiri uses his personal experience to substantiate the reality of how one can identify God’s voice and do according to the instructions thereof. Being one of the greatest pioneers of the prophetic ministry in our time, Shepherd Bushiri tells his gripping and life-changing experience of how God called and taught him the different ways to prophesy. He uses this testimony as a metaphor of what God can do for Christians who have daring faith, and the desire to lay claim to God’s prophetic promises. This prophetic guidance will undoubtedly point the way, direct church leaders on course, offer biblical instructions, and provide spiritual insight for those who are searching for it. In the Bible, the book of Nehemiah presents the revelation of physical gates that are also understood to have spiritual meaning. The setting and location of the gates is based in the city of Jerusalem. Shepherd Bushiri, refers to these gates as prophetic gates. He describes these gates separately to refer to the journey that is the life of a believer. This book best enlightens on the different stages in a Christian’s life, and the different steps that lead from one gate to another. The book also helps one to understand the kinds of challenges and obstacles a believer can encounter on the pathway to another level. The book, Prophetic Gates captures every aspect of a believer’s journey from the time he or she is born again until they reach maturity. This book is recommended for anyone who is a believer and is interested in understanding his or her journey with God here on earth. In this book, Shepherd Bushiri unveils the dire effects of the spirit of familiarity that operates between a spiritual father and his sons and daughters. Many people today, have missed their blessings simply because they came too close to the anointing. The effect is that what was supposed to bring them heavenly solutions ended up being something common and ineffective. Shepherd Bushiri takes on the mission of explaining how the anointing can work for you and how you can diligently serve your spiritual mentor just as Elisha did to Elijah. He desires that this book will act as an inner compass that will direct you to the fulfilment of your highest purpose in the body of Christ, as both a steward and custodian. Whether you are a son or daughter in the church, starting out, starting over, or wondering whether there is a great success in being a mentee in the prophetic, this book is set for your season. Clear your path of distractions and disruptions. Correct the pathways where you veered off course. Be ready to learn and with this book from Shepherd Bushiri, seek to become an example of what it means to be a beneficiary of the prophetic covering. In this book, Shepherd Bushiri gives an in-depth analysis of the various names of God and the relevant contexts in which you can call them. After reading this powerful book, your prayer life will be transformed and revitalised. It will help you to stop calling the God of healing when you need the intervention of the God of peace. Shepherd Bushiri takes you on a journey from speculation to revelation as he outlines the 13 different names by which you can call God. If you are in a situation where you do not know what to do or how to solve it, do not despair. You are the right candidate for whom this book was written. “It is high time that you call unto the name of God who deals with that particular situation. You will be surprised to know that God is multi-dimensional. When your situations change, your God does not change. He remains constant. You just have to tap into the dimension of His authority that deals with the situation at hand,” Shepherd Bushiri advises.